In the Hawaiian culture ‘ohana means family, including blood relatives, extended family and intentional community. The concept of ohana emphasizes that families are bound together and members must cooperate and remember one another. I was about to connect with and learn from my Hawaiian spiritual family in magical, synchronistic ways! After my dolphin swim I did not feel the same. My energy was expansive, open, willing. I was calm and more aware of my self and surroundings in a way I had never experienced before. In my curiosity and vulnerability I asked Life, The Universe, for a sign to guide and direct me to what, who, where was next. I intentionally chose to cultivate my Edgewalker Skill of Sensing the Future, staying open and expectant to the CEO (Clear, Easy, Obvious) response. I randomly opened a book on Hawaiian health, healers and retreats. A photo of a man named Jim, looking very familiar, stared back at me. He was living on the northern side of the Big Island in a town called Hawi. As I read about his work as a global consultant speaker and retreat leader I realized I met him at a World Business Academy in Santa Barbara many years before. Coincidence? No, a Divine sign. I decided to contact him and he suggested we meet in Hawi. As I was driving north to meet Jim I got a call on my cell phone from Bonnie, a good friend in Naples, Florida. She mentioned her dear friends Joel and Michele who lived part time on the Big Island and owned Kohala Sanctuary in Hawi. The Divine Timing of her call as I was driving to the same town to meet Jim was incredible. Jim and I met in a local coffee shop in Hawi and instantly connected, reflecting on the conference we both attended years ago. While at the coffee shop I also noticed a beautiful woman who I felt connected to yet did not have an opportunity to meet. Jim introduced me to Joel and Michele who were his neighbors at the Kohala Sanctuary. It was a magical moment, leading me to the next place on my journey. Michele and Joel invited Jim and I to their 12 acre Kohala Sanctuary – paradise on earth! When I walked onto the deck of their home I noticed the beautiful woman Mayra from the coffee shop, my future soul sister from Austria, sitting there. It turns out she also knew them and was having a retreat on their land. As I stepped out to look at the breathtaking vista of the Pacific Ocean and acres of lush gardens of fruit, flowers and vegetables I remembered seeing this view in a vision months before I left Florida when I was on a labyrinth walk. At the time I set the intention to be guided on my Edgewalker Journey of the unknown to what is next in my life. This exact view was clearly shown to me at the time yet I had no way of knowing where it was or what it would mean to me in the future. *Set an intention and ask for what you want, even if you are not clear. Say it out loud, write it down, act as if. Go for it and play big! *Speak the Mantra – “THIS OR SOMETHING BETTER” after each prayer or intention. The Universe opens a bigger space and co-creates with you to fill in the blanks with creative solutions and abundant blessings. *Prepare for the unexpected. Allow life to dazzle you with it’s magic and messages! I am excited and inspired to share my 10 year “Edgewalker” journey from 2007-2017, where I took a leap of faith, stepped into the unknown and rode the global magic carpet ride, learning to trust myself and the Universe. 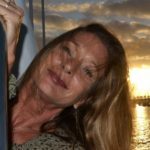 “Facilitating Evolutionary Leaps of Faith” defined my path, led me back to my authentic self, and a way of being and living that I could have never imagined. Please join me in my weekly blog as I share the lessons, inspiration and messages from this transformational period of my life. They are also relevant and important to the current times of change and uncertainty, possibility and opportunity we find ourselves in. “I was standing on the moonlit beach in Naples, Florida where I live in January 2007, witnessing a full moon eclipse in my birth sign of Scorpio. Eclipses are powerful at releasing and letting go of what no longer serves us. “Show me a sign!” I yelled to the transformational moon. I felt called to make a change. I was ready yet I felt stuck, unclear, lost, unsure of where, how, when. As I went to sleep that night, tired and confused, I dreamt that the fire alarm in my rented townhouse was going off. I was between worlds, not sure if I was awake or dreaming. However I was too tired and chose to “stay asleep” and ignore the alarm. The next morning when I awoke all was well and no alarm had rung in the night. I went into my day. My business as a speaker, trainer, workshop and retreat leader, executive, life and business coach often took me away for a day or longer. As fate would have it that day I was giving an all day training in nearby Fort Myers. When arriving back home after dinner I opened the door, turned on the light and noticed black soot covering my entire townhouse and all the possessions in it. I realized there was a fire that started in the kitchen in the ice maker making the smoke toxic and my home unlivable.”Next time can you show me a sign more clearly, easily and obviously (CEO)!”as I yelled to Universe and powers that be. Scorpio is about death and rebirth, the phoenix rising from the ashes. Talk about a literal sign! I got the message. I couldn’t not pay attention and stay asleep anymore to the signs of my life that were not working. After moving into a friend’s house during the transition I had the unfortunate task of going through my possessions. Since the smoke was toxic I was forced to review all that was toxic in my life and really got clear where I was stuck. Attachment and identification with my possessions, titles, outworn relationships,money, behavior patterns and old beliefs that were no longer serving me were now obvious. Little did I know that 10 years later as I write this blog in January 2017 on Maui, Hawaii my entire life would change. The next days 10 years would be transformational, liberating, a magic carpet ride. It was the beginning of my “Edgewalker Journey” as I took the leap and began “Walking on the Leading Edge”. Pay attention to the signs in your life. Be careful what you ask for and how you ask.